These simple lollies combine kiwis, peaches and strawberries to create a triple fruity ice lolly for kids. Add strawberry puree to your ice lolly moulds until they are around a third full, then freeze until they are firm (around 1 ½ hours), then add a peach puree, and repeat. Finally, fill up the remainder of the moulds with kiwi puree to make your traffic light lollies. Juice some oranges and puree some carrots and then simply combine the two and freeze in lolly moulds to make some simple, sunshine-filled ice lollies that kids will love, packed full of healthy vitamin C and other nutrients. Why buy unhealthy store-bought versions when you can make your own using three simple ingredients? All you need is strawberries fresh from your polytunnel, semi-skimmed milk and a can of light condensed milk. Blend the ingredients, freeze then enjoy as a sweet summer treat. 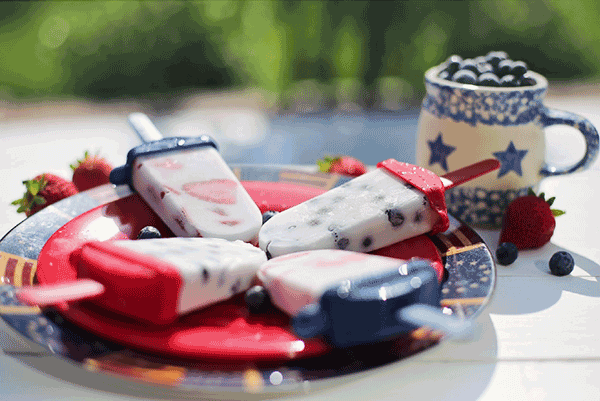 There are plenty of ice lolly recipes that call for a variety of summer berries. You might have raspberries, blackcurrants, redcurrants, white currants and more available in your polytunnel or elsewhere in your garden over the summer months. To add an extra punch of nutrition, consider adding roast beetroot purée to the mix, for delicious lollies that kids will never guess are a healthy option. You can add a little sweetness with honey if required. You can even up the nutrient content even more by sneaking in some spinach – the kids will never know it is there! Cucumbers, mint and lemon juice can be combined with honey for sweetness (to taste) to make super-refreshing ice lollies for the summer. For grown up gatherings you could even add a sneaky nip of gin to these refreshing summer treats. These are just some of the interesting ice lollies that you might be able to make using produce you can grow in your polytunnel. Whether you are looking for a way to get the kids to eat their fruit and veg, or for a more grown-up treat for a summer party in your garden, ice lollies could be the answer. Do you make ice lollies using things that you have grown in your polytunnel? Let us know in the comments below.